The city of New Westminster is one of the oldest inhabited spaces in British Columbia. Although many commercial spaces have been modernized, homes boast their historic qualities. Owning an older property comes with its charms but it also comes with a lot of extra work. 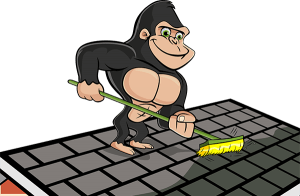 Let our Gorillas give you a hand with our New Westminster roof cleaning and moss removal. A quick walk around any neighbourhood shows its age with something as simple as as a plaque. Although your home may boast about its age, you do not want its condition to give it away! Maintaining the structural integrity of your property is a top priority for homeowners in New Westminster. That is a top to bottom job! The roof of your property requires a lot more TLC than it probably gets. When you are resting after a long day, your roof is always working for you. Your roof is your first line of defence against the outside elements but without proper care, it can become more of a problem! Over time, your roof collects clutter, particularly in a plant-friendly community like New West. Large trees provide greenery and shade to home and businesses in the area but they also shed organic debris. This fall-off clutters roof surfaces and can pave the way for moss growth. “A stitch in time, saves nine”. Many Canadians are familiar with this particular rhyme and other are familiar with the need to act quickly to avoid larger issues. This is often the case when it comes to roofs. Your roof is in a daily battle against the elements and short of going up to check on it, there is no way to monitor its condition. This is where our New Westminster roof cleaning and moss removal comes in.